Happy Halloween, no Tricks here, just CANDY! What would a Halloween posting be without a little Blog Candy"! First I'll share my project, then fill you in on how you can win your own copy The Technique Junkies Newsletter CD#7 (the pink CD)! For my project I used the Coffin Box Die Cut from Creative Cuts and More. After assembling my coffin, I placed the lid on a piece of Stampin' Up! Night & Day Specialty paper, traced it, cut it out, trimmed it a bit, then adhere to the coffin top. The image is from Stampin' Up! From the Crypt done in the Split Negative Technique from a past issue of TJNL. I stamped the sentiment from Teeny Tiny Wishes in Black on White then punched with the Word Window Punch, layered on a Black panel punched with the Modern Window Punch I adhered this under the Black Grosgrain tied around the coffin box. So, how can you win your own copy of CD#7? Simply leave a comment on this blog post with with your Favorite Halloween Candy or Costume, by November 2nd, I'll post the Winner on November 3rd - Good Luck! Remember Blogger does not record your email addresses, so be sure to check back, or subscribe to my blog so you don't miss when I post the winner. I don't really have a favorite costume. Each year the boys got dressed up became my favorite costume, now that they are older, I miss those costumes! I asked my oldest who is attending a costume party later tonight what he was going as, his response "myself, Redneck Jim". So what is he wearing? A pair of flannel patched jeans, a cut off flannel shirt, cowboy hat and cowboy boots. As for my favorite Halloween candy, I love Candy Corn and Milky Ways! Happy Halloween. My favorite treat is those little orange pumpkins, followed closely by candy corn and any of the Halloween peeps. Favorite costume--well it was me in the first grade I went as a little boy fishing--won lots of awards--my family was poor, everything was something from home and cost nothing. My mom warned me before I went not to expect any prizes cause we didn't have $ to buy a costume! Hi Lisa: Love your treat box coffin, they would make great hostess gifts of treats in school when I was always a room mom. Love that split negative skull. I'm with you on the favorite costume thing. So this year my daughter and her boyfriend are going as pirates, so I'm going witht he pirate costumes, my favorite candy is Good & Plenty, it's the only candy I like!!! Happy Boo day to you. 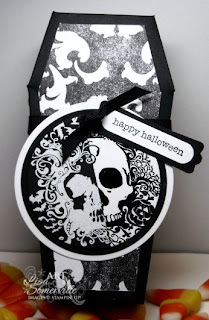 Love the coffin and the stamp is perfect for a negative/positive technique! My favorite Halloween candy is candy corn. Have you tasted the caramel apple flavored candy corn? It appears in our grocery store around Thanksgiving time. Lisa, this is AWESOME! You are so dang clever! I think I have candy corn stuck in my teeth as I'm typing so that would be my favorite with Butterfingers being a close second. My favorite halloween costumes are those that are creative and usually not store purchased. Of course I'm lazy this year so my daughter's is store bought whereas Christopher is going to be a baseball player. Yankees, of course! Happy Halloween! Great project to post today -- and I love the split negative technique! Favorite candy? Candy corn, for sure. Different flavors, the original stuff mixed with peanuts... any variation thereof. I'd be buying out the store if I weren't diabetic, LOL! I will dress as myself---OLD---bathrobe, Stockings rolled down, and old shoes. My favorite Halloween candy is Reese's and Nerds! wow..I would absolutely LOVE to win this! I love candy corn..and my kids are all grown so my fav costume is my GREAT niece in a "chicken costume"..she is 1 yr old..ha ha! Loved the coffin, seen a differnt coffin at our scrapbook store in town and was so neat. I need to make one. haha. Favorite candy is snickers, kit kat's and reese's , oh heck I like any and all candy. ha. Costumes we never bought any, always had to make mine as a kid. I always love your blog and beautiful cards! I am really in to anything dark chocolate. In fact, our little dog managed to get into a tin that I had some small dove choc. in, and he delivered one to my daughter and one to me. They were still wrapped, so we ate them! Both he and my daughter are going as zebras tonight at a party she is giving. I would love to win!! My favorite Halloween candy is the candy corn and those little orange pumpkins...all sugar I know. Hi Lisa! My favorite candy is Twizzlers licorice. Um, my favorite costume was a box decorated to look like dice! I would love to win that pink cd from Technique Junkies. Your project is awesome! I love anything with chocolate so it would be hard to narrow down my favorite. Right now I am enjoying Dove's milk chocolate but I can just as well love a Twix or Heath or anything else with choclate. My favorite costume has to be the year I went as a beatnik (yes I am showing my age). This had to be in the late 50's because I remember my little sister going with me. We got to go over to my aunt's house and trick or treat from there. I still remember what a ball I had. The pic is Roscoe going as a hunter. Oh, how I love Halloween so I can stock up on the marked down candy the day after! Just about anything chocolate for me, but 100 Grands are my favs (next to Ghiradelli, but they count in my Christmas fav!). I must have candy corn, but the Indian corn mix is the best. My favorite costume was about 10 years ago when I was working in the lingerie department at Mervyn's. I made my own costume & went as a Playtex bra box. I took a sheet & drew & painted everything from the real box. A sharpie pen made the writing easier to do. I squared off my shoulders with foam core & viola', my costume was born. Needless to say, I won the most original contest hands down! Happy Halloween Lisa, my favorite costume so far was when my husband & Iwent as a pair of dice. We spray painted 2 large boxes white, cut out black circles and also cut holes for our head & arms. My favorite candy is candy corn. Thank you for offering blog candy. Happiness, Carol G.
my favorite candy was milky way and snickers. heck! it still is! candy corn is great once a year...as are peeps and circus peanuts! my favorite costume was when my friend and i dressed up as twins. My absolute favorite treat for Halloween is pumpkin seeds. My favorite kids custome has to be the NASA astronaunt outfit my son wore this year. My favorite adult custome . . . well . . .I just saw pics from a blogger who dressed up as the evil witch on the Wizard of Oz and dress her dogs as her flying monkeys. It was just too cute! Happy Halloween! Cute coffin(are coffins considered cute?) Well this one is. My favorite costume would have to be when my DH and I went as a cow ,yes complete with udders. He was the back end of course! My favorite candy just about anything chocolate , but Peanut butter cups are high on my list right now! P.s Thanks for the info on the disclaimer! What great blog candy, Lisa! My favorite costume is anything that involves dressing in theme with one of the kids. I think my most fav was the year I dressed Drew as a frog prince and I went as the princess. My favorite Halloween candy is Tootsie Rolls, especially the fruity ones! My favorite candy is anything dark chocolate. My favorite costume would have to be the Baby Bop costume I made for my granddaughter many years ago. Now I'm saving it for great-grandchildren. This is such a fun project, Lisa! I so wanted to give it a try, but never got around to it! Maybe next year! LOL!! MY favorite Halloween Candy is the Milk Duds and favorite costume this year was the Baby Lamb that my 8month granddaughter wore. My favorite candies are red twizzlers & candy corn. Your coffin is great. A favourite candy!!?? Hmmmm... A taffy apple? Maybe. Your project is beautifully done! Thanks so much for sharing! My favorite Halloween candy is candy corn with the chocolate. I like to eat it one color at a time. It just tastes so much better that way!